Happy Tuesday! 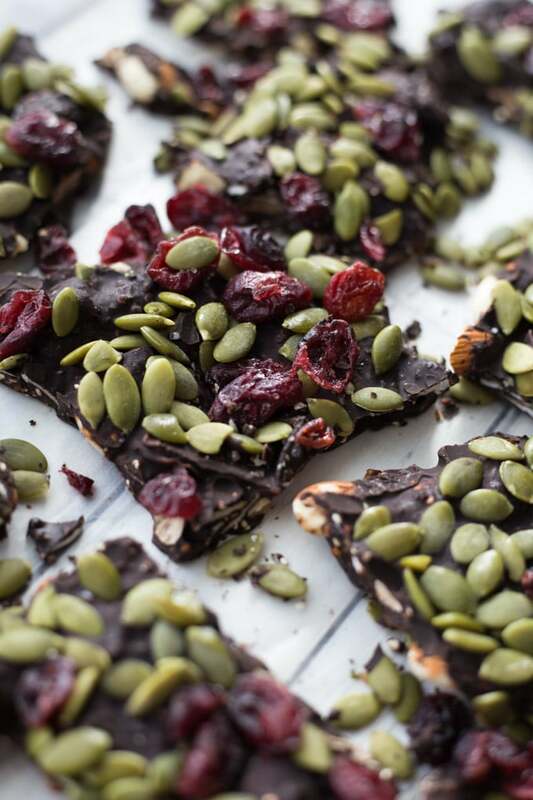 If you’re heading back to work today after the long weekend, you probably need this Loaded Dark Chocolate Autumn Bark to get you through the week! 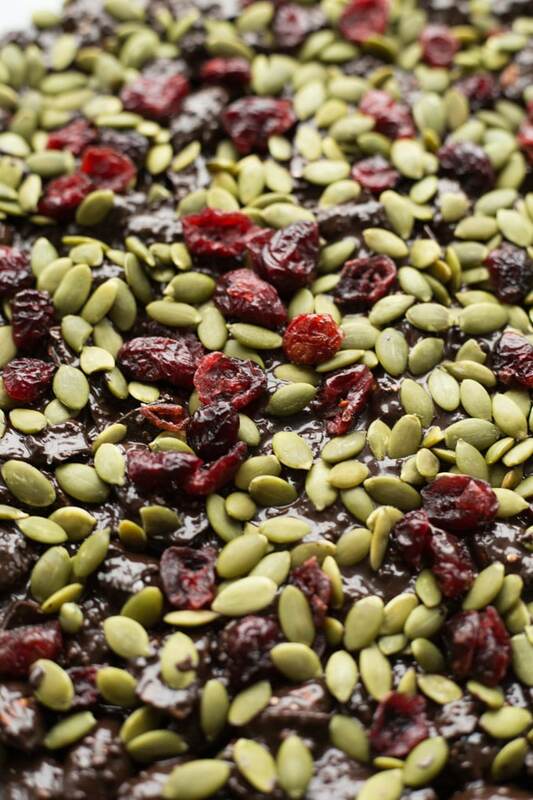 It’s packed with nuts, seeds, coconut, quinoa, dried cranberries and, of course, dark chocolate. 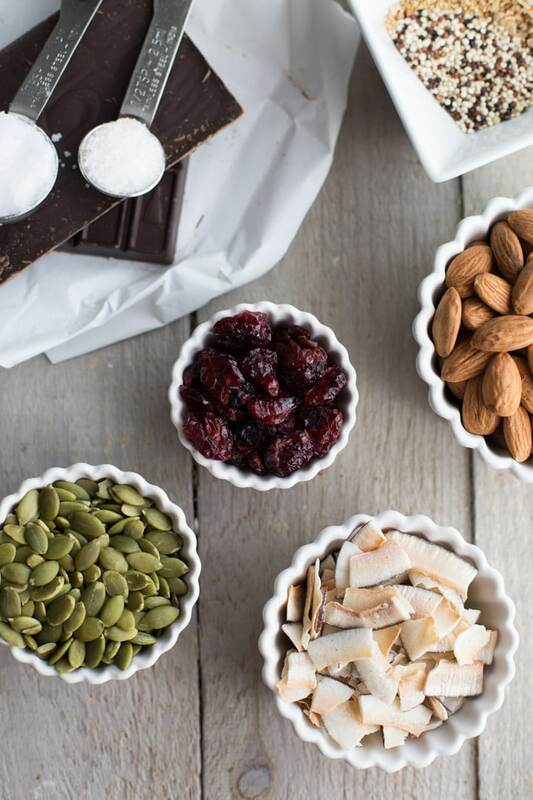 So you get clean eating ingredients with a little bit of indulgence. Win-win! 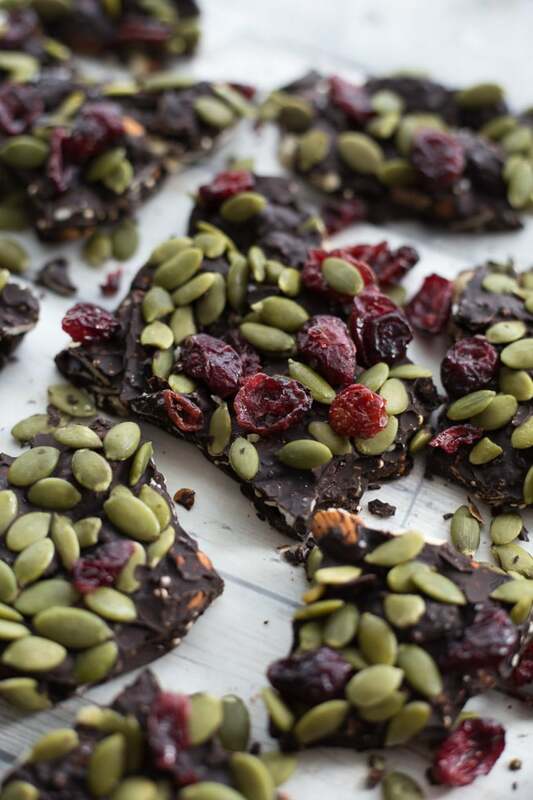 In the meantime, I thought we could all use a little simple today, so I’m changing things up and sharing this recipe for Loaded Dark Chocolate Autumn Bark. I always like to have chocolate bark on hand because it’s one of those quick, almost clean eating desserts that my husband will eat. And this isn’t your typical chocolate bark. While it still includes lots of chocolate, I made sure the clean ingredients far outweighed the chocolate. So I “loaded” this bark with lots of raw almonds, raw pumpkin seeds, coconut chips, dried cranberries, uncooked quinoa, dried orange peel and maple flakes. Like I said, it’s loaded! Instead of mixing all the ingredients into the chocolate, I left the cranberries and pumpkin seeds for last, and sprinkled them on top. I did this for two reasons: it looks pretty and it makes it easier for my husband to pick off the cranberries! (He doesn’t like them but I couldn’t resist adding them to this autumn bark). Perhaps the best part about this bark is the 1/2 tsp sea salt sprinkled on top. It might sound like a lot of salt, but it totally complements the richness of the dark chocolate and the tartness of the cranberries. Dark chocolate bark has turned into an accidental staple in our house. What I mean to say is that it’s never a planned recipe, but something I randomly assemble when I’ve melted too much chocolate for another recipe. I just can’t let chocolate go to waste! So when I have too much melted chocolate, I usually add whatever seeds and nuts I have on hand and quickly whip together a chocolate bark. It’s an easy peasy dessert if you ask me! I know this bark isn’t strictly clean eating, but as I’ve said many times before, I try to eat by the 80/20 rule. So 80% of the time I eat clean and the other 20% I usually eat what I crave. This Loaded Dark Chocolate Autumn Bark is a bit of both – clean eating ingredients covered in chocolate and totally crave worthy! And besides, some would say that a little bit of dark chocolate is actually good for you, so you might consider this bark totally healthy 😉 !! 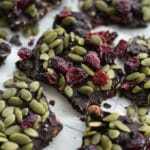 So that’s my simple recipe for Loaded Dark Chocolate Autumn Bark. It seriously takes just 5 minutes to assemble and a little bit of patience as it sets up in the freezer. The easiest dessert/snack you will ever make and the perfect way to adjust after a long, indulgent weekend! If you make this recipe, please let me know what you think in the comments below, or tag a picture with @crumbtopbaking and post it to Instagram! 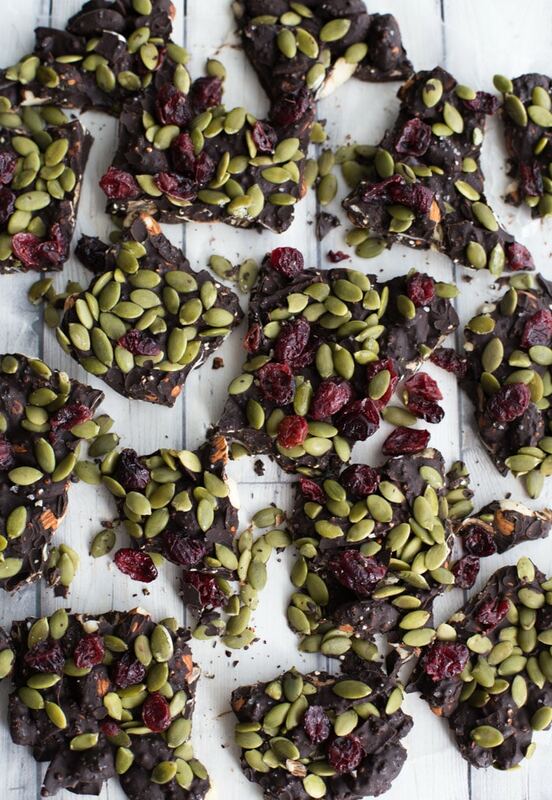 This Loaded Dark Chocolate Autumn Bark takes just 5 minutes to make and is “loaded” with lots of clean eating ingredients like almonds, pumpkins seeds, coconut chips, quinoa and dried cranberries. Add the dark chocolate and sea salt, and this bark is irresistible! Add the chocolate and coconut oil to a small sauce pan and melt over low heat until smooth. (See notes below on melting chocolate). Remove from heat and stir in the almonds, coconut chips, quinoa, orange peel and maple flakes. Once combined, spread out on a baking sheet lined with wax paper. Sprinkle the sea salt, pumpkin seeds and cranberries on top and lightly press into the mixture with the back of a spoon. Place the bark in the freezer for half an hour, or until set up. Break into pieces and store in an airtight container in the fridge or freezer. When it comes to melting chocolate, many sources suggest a double boiler or the microwave. Depending on the recipe, sometimes I melt the chocolate in the microwave in 20-30 second intervals, stirring in between, until the chocolate is melted and smooth. I find this usually works best with chocolate chips. Shamefully, I never break out my double boiler to melt chocolate. If it’s chocolate chips, chunks or squares, I normally just melt it in a sauce pan over direct heat. This does risk burning the chocolate, but I find if I use the lowest heat possible and stir the chocolate constantly, it never burns. While this is my method, feel free to use a double boiler or microwave to melt the chocolate for this recipe. For this recipe, I’ve used both Baker’s Dark Chocolate (70% cacao) and Laura Secord mini chocolate chips (70% cacao). Both worked well, although the Laura Secord chips did have a darker, richer chocolate taste. I found both the dried orange peel and maple flakes at Bulk Barn. This looks so amazing Leanne! I need to make it soon and I love your blog! 😀 Love browsing around here!! Thank you Kim! That’s so nice to hear. I’m glad you enjoyed browsing around! This bark is a favourite in our house. My husband will even eat it ;). If you make it, please let me know how it goes!! Oh look at that bark. Supremely rich and indulgent! I am tempted to make some now. Loving all the colors here. Thanks Neha! Isn’t dark chocolate bark the best!? Hope you have a chance to give it a try!